Stephanie Shipman and Kelanie Murphy in studio rehearsals for Paula Weber's Unplugged the week prior to the concert. I should note that as good as they are they are not yet fully a professional company but then that is what they are learning. 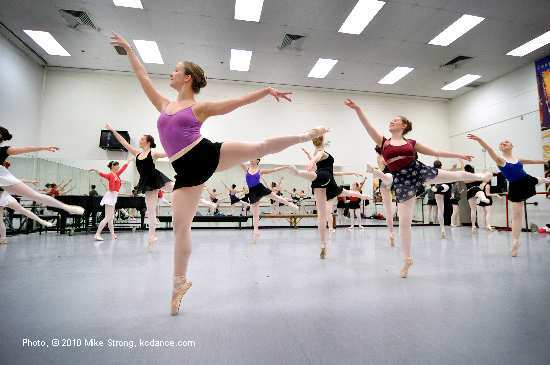 Watching the progress of the students from the time they first come into the program, through their studies and through gigs at dance companies until their senior year is almost always rewarding. Watching their performances is always a treat, as long as you factor in the inconsistencies which come with being students with vastly divided attentions from studies to dance study and workouts, to part time work to earn money to auditions and gigs along the way to graduation. The concert was In the Performing Arts Center (PAC, same place you go to for The Rep) in White Recital Hall (all the way to the west side of the PAC). One of my interest points is the juxtaposition of Josh Beamish and George Balanchine. The Beamish piece "Les Oiseaux" (The Birds) is a mix tape of Michel Fokine's The Firebird (1910) (music by Igor Stravinsky) and Petipa's Swan Lake. Borrowing from the classical foundation of both pieces Beamish mixes the characters in a high-energy fusion to create a new ballet. The irony is that the Balanchine ballet was new and high energy when Balanchine himself was alive and now seems institutionally codified with virtuoso technique and unchangeable choreography with the Balanchine Trust having ownership and copyright. Putting the two pieces together in the same program highlights this irony. Partly for this reason I have no photos of the Balanchine piece at this time even though these are some of the best I took from this concert. If they show up here they will have to go through an approval process. This is not my usual way of working, but in this case I was also shooting the show for the division rather than covering only for media and I had not clarified usages (archive and editorial) and there was a huge blow up in the PR department to which I've not yet had the time to fully respond as I intend. As much as I criticize media (news) photographers for clueless dance shooting I also find the Balanchine Foundation over protective to the point of harming their own interests. The photos on this page at this writing are of other pieces, and none of the Balanchine piece. George Balanchine left the young Soviet Union in 1924 following a year in which the experimental dance company he started found dis-approval with the Soviet authorities. He was told he had better toe the line. He left for Europe and developed a career there which is where Lincoln Kerstein found him, invited him to come to the United States and then partnered with Balanchine to change the face of dance in the US and around the world. They tried one thing after another. They were never locked into conventions. The Balanchine pieces are considered a feather in the cap of any company to be allowed to perform. The trust is choosy and careful to send a repititeur, in this case Jerry Kumery, to ensure quality control and adherence to the Balanchine canon. That is the strength of the standard and also its Achilles heel. Ballet gets a "hoity toity," even stodgy reputation because of those standards but it wasn't so long ago that those pink, skin-like tights were very evocative, tempting, sexual, possibly even licentious. Degas' works show shadowy "patrons" lingering in the wings waiting for certain dancers. Remember that was a time of hoop skirts and other very full body coverings. This was a time when the sight of an ankle was considered hot. On the ballet stage were body-hugging costumes top to bottom interrupted only by relatively brief skirts and tulle. Exposed legs and high kicks with less covering than Can-Can dancers as high art and those rich, shadowy patrons. Then ballet was still hungry and adventurous and new. 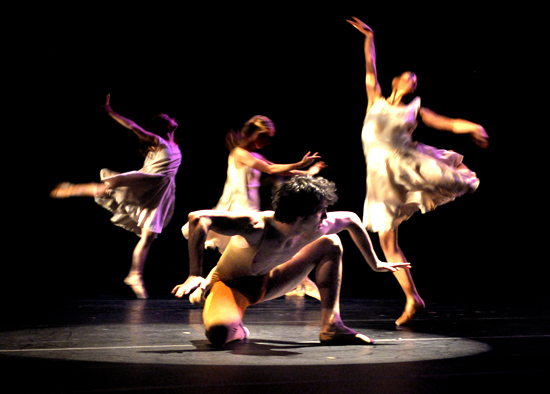 You got a feeling of that adventure and edginess with Josh Beamish's ballet Les Oiseaux. As with most good adverture it has a solid foundation in the past with recognizable characters, the firebird, the swans, and then it steps out with all the expressive energy it can create anew. 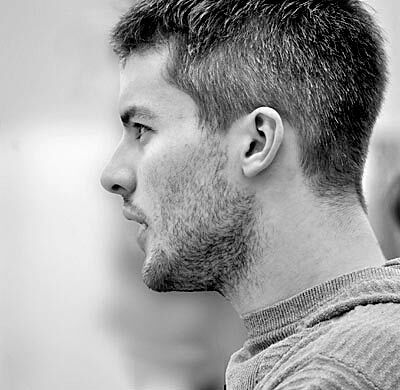 Beamish is a young man with a very solid grounding in dance and a full set of experience in arranging dancers as he imagines them. He is hungry, as once were those we now think of as classical. He is filled with the need to create and to propagate his creations. He already has a dance company in Vancouver, his home, and has maintained it for several years. They are already touring across the world heading for the Asian continent this year and working with Circ de Soleil. Watching him work is interesting because he is able to combine companionship with these young dancers who his own age, without losing the leadership role. He can play with his dancers, working out movement and crack the whip as he needs, without any gear changing, without removing himself. If he has any pretension somewhere, I have yet to see it and I've spent a good deal of time in his rehearsals. His Firebird for this piece, red-haired, Britanny Duskin, was going through her paces one February day at less energy than he wanted. It was rehearsal, after all. But Beamish told her no excuses for that energy, always come through at the max. Duskin is a good dancer, whose long, flaming, voluminous, curly red hair would go well with the flaming-red costume for the character. Beamish wanted more from her. Duskin delivered. In performance you might even say she darn near stole the piece, and her role was to run through the corps at several points in the piece for a short while each time. But wow, did Brittany ever look like a fire itself, really a fireball of roiling, bursting, turbulent, violent energy which totally wiped out the rest of the stage every time she was on. I literally held my breath as she came in and until she went off stage. In the camera viewfinder she seemed almost like an animation of flailing legs and arms in one of those balls of action cartoonists draw. When I first saw her come out in dress rehearsal I remembered Josh's correction in the studio which had seemed almost out of place for him and even a tad harsh. It was a very short and quick criticism and he didn't belabor the point. Then later, when I saw the result on stage, costumed, lit and matured, I realized immediately how right his corrective had been. It was perfect for her and she was perfect in the role. When Fokine did The Firebird in 1910 he was interested in getting rid of virtuoso techniques for their own sake rather than as a means of expression. I would like to see the Balanchine Trust find a way to excite that kind of fire in their catalog of pieces. George himself is not coming back. He is long gone. But as I thought about the confluence of these two choregraphies, I realized that the foundation is losing the vitality which made Balanchine so fabulous and is substituting technique and strict adherence to established form. 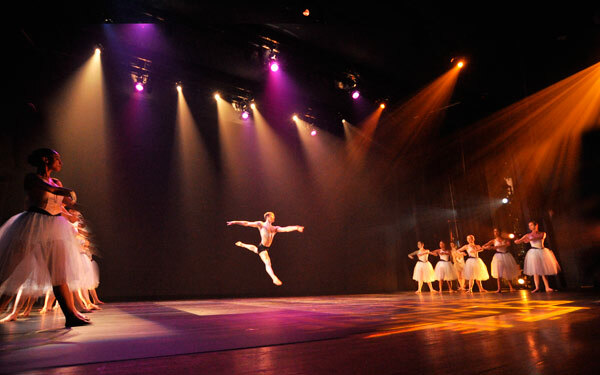 Some of those techniques are appreciated more by the dancers as tests of capability than the audience on whom some of it may be lost. 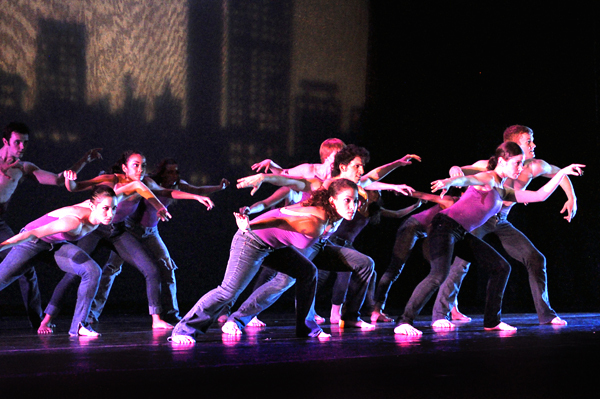 Living choreographers change their works all the time. Updates, refinements, rethinking and re-working. It keeps the thing fresh. Perhaps they could try something along the line of what Twyla Tharp does, which in a sense turns out a kind of assembly kit of Tharp bits and pieces, building blocks, which are then turned into a new, deliberately derivative work, but freshly envisioned by presenters of her pieces. 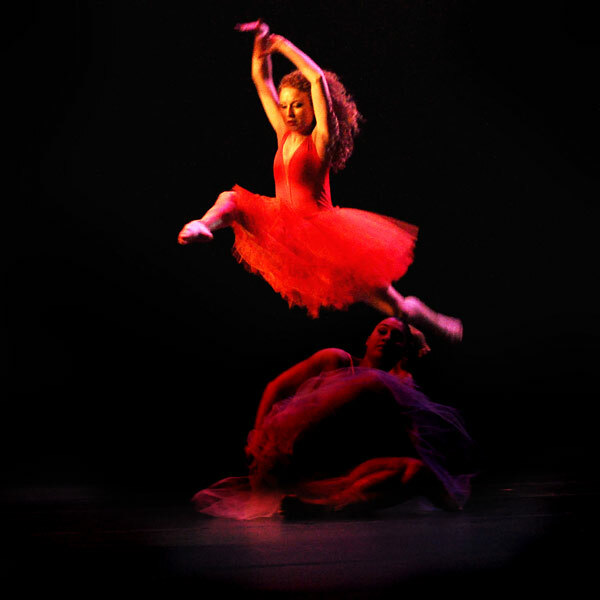 Duskin was a wild, ferocious, ball of extreme energy onstage as her Firebird character raced through the dancers. Gary Abbott's Purple - in this combined photo (from two shots so that) we can see Miyesha McGriff Hoisted above Mark Geiringer (left) and Erik Sobbe (right) as she flexes down and up. This was on the left side of the stage while the same action was paired on the right (audience) side of the stage with Skylar Taylor. The Balanchine ballet presented in this program is protected by copyright. 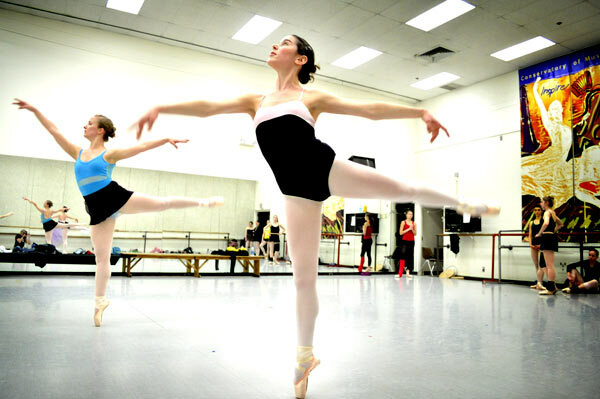 Any unauthorized recording is prohibited without the expressed written consent of The George Balanchine Trust and the Conservatory of Music and Dance - UMKC. 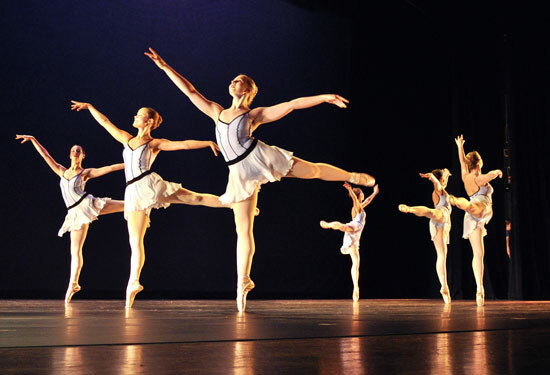 The Balanchine ballet presented in this program is protected by copyright. 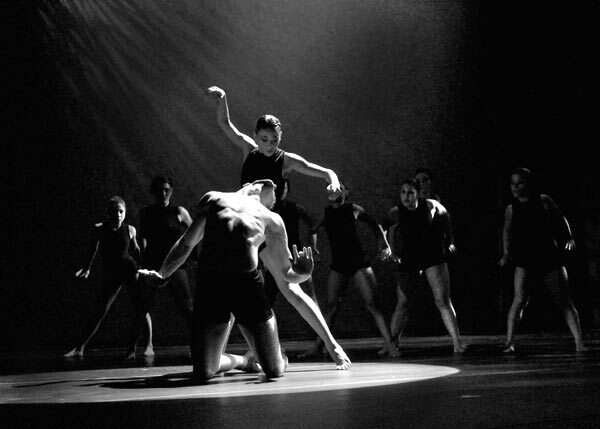 Any unauthorized recording is prohibited without the expressed written consent of The George Balanchine Trust and the Conservatory of Music and Dance � UMKC.